After a cancerous lump was discovered and removed from her left breast in 2008, then 25-year-old Shelley Barnes received an early education about the specifics of breast cancer, including detection methods. One lesson involved learning the balancing act that exists between imaging modalities with the sensitivity to locate questionable lesions in breast tissue and those with the specificity to determine the severity of those lesions. Ultrasound and MRI were used in conjunction with mammography when Barnes was first diagnosed with breast cancer. When the disease struck again, this time in 2010, the young systems analyst for a Washington, DC, law firm benefited from the addition of breast-specific gamma imaging (BSGI) to her screening regimen. BSGI screening had been introduced after her first breast cancer diagnosis. This time, the cancerous mass in her left breast was detected in its early stages by BSGI. In both of Barnes’ bouts with breast cancer, the mass was neither visible in a mammogram image nor detectible during self-examination. Breast imagers and surgeons are finding more instances where BSGI adds a level of peace of mind for women, particularly those with indeterminate mammogram results. This modality, also known as molecular breast imaging (MBI), images the metabolic activity of breast lesions by utilizing radiotracer contrast and a high-resolution gamma camera. They believe that using a physiological approach to breast cancer detection allows for more specific evaluations and improved management of challenging cases. For Jean Weigert, MD, FACR, director of women’s imaging for the Hospital of Central Connecticut, BSGI is a vital diagnostic tool used in conjunction with other modalities. A recently completed clinical study of more than 1,000 patients that she presented at RSNA 2011 looked at how BSGI’s gamma camera capabilities play a role in early breast cancer detection by adding improved specificity to the sensitivity of breast cancer screening and diagnosis. Another clinician involved in the study, Lillian Stern, MD, director of breast imaging at Methodist Hospital in Philadelphia, agrees about the importance of not only discovering what is in the breast but also what isn’t there. “When a patient feels something but nothing shows up on a mammogram, they wonder if there’s really something there or not,” Stern says. Weigert is first author on the study comparing BSGI with mammography and ultrasound. The study showed that BSGI had greater sensitivity and comparable specificity with ultrasound and diagnostic mammography. In addition, this technology is a valuable adjunctive procedure when these anatomical imaging modalities fail to provide a confident diagnosis. BSGI is also a useful diagnostic modality to augment mammography to manage patients with difficult-to-diagnose breast tissue and in cases where unresolved clinical concern remains after a mammogram. For this study, BSGI was conducted with the Dilon 6800, a high-resolution gamma camera. To perform BSGI, a patient receives a pharmaceutical tracing agent that emits gamma radiation after it is injected and absorbed by all the cells in the body. Due to their increased rate of metabolic activity, cancerous cells in the breast absorb a greater amount of the tracing agent than normal, healthy cells and generally appear as dark spots on the BSGI image. Efforts are under way to try to reduce the radiation dose used in the contrast injection, Stern says. Dose tends to be an issue when it comes to molecular breast imaging, but she notes that the radiation dose from BSGI is similar to what the FDA has approved for use with cardiac stress tests and CT scans. Weigert, who first used a gamma camera in 2005, notes several instances in which BSGI helped determine where to biopsy in women who received indeterminate mammograms. Even after follow-up screening ultrasound exams, she still wasn’t sure where to perform the biopsy. That’s where BSGI came in. She was impressed from the start, using the technology with approximately 800 patients from 2005 to 2007, with favorable comparisons made between BSGI results and ultrasound as a follow-up to mammography. Even simple marker lesions can be detected with BSGI, she says. She cites two cases in that time where patients had no risk factors for breast cancer but showed “something that didn’t look right” in each of their ultrasounds. Using BSGI, she could see a “definite focus of abnormality.” She was able to biopsy those areas and make an accurate diagnosis. In another case, gamma imaging actually clarified a woman’s diagnosis for a more favorable outcome. In addition to women with indeterminate mammograms, Stern sees several other areas where using BSGI is effective. For example, if a patient could benefit from a breast MRI but cannot enter the magnet for whatever reason—whether she has metal in her body, such as a pacemaker, or she is claustrophobic—she could safely undergo BSGI. Stern also says that in some cases a patient’s insurance is more likely to cover BSGI than MRI. Another area where BSGI is being used over other modalities is in patients who already had breast surgery. Mammography images will show scar tissue as something unusual; however, scars should no longer be visible one year after surgery. BSGI has a high sensitivity for ductal carcinoma in situ and lobular carcinoma, she notes, referring to these as the “sneaky” breast cancers due to greater detection difficulties. Both cancers can masquerade as normal tissue in standard mammography. From a surgical perspective, BSGI helps clarify the view concerning where to biopsy; the device also includes a biopsy tool. According to Christine Teal, MD, FACS, chief of breast surgery at The George Washington University Hospital in Washington, DC, BSGI is useful in surgical planning as well. Teal, who was the surgeon for both of Barnes’ lumpectomies, says BSGI is helpful for screening women at high risk of breast cancer; it was determined after Barnes’ initial cancer diagnosis that she has dense breast tissue, a high-risk characteristic. However, she has no family history of the disease. Overall, Teal says she has seen “impressive numbers” in identifying cancers in asymptomatic patients such as Barnes. “If a woman’s mammogram is indeterminate and there’s something that looks like dense breast tissue, we can use BSGI to find out for sure,” Teal says. “In Shelley’s case, she was on a schedule to receive regular BSGI screenings, and that’s how her second cancer was found. While breast MRI is used to screen high-risk women, Weigert said many physicians don’t want to use MRI in indeterminate patients because of that modality’s high sensitivity but lower specificity. There is a likelihood of more false-positives with MRI, as the technology is more sensitive but doesn’t provide the specificity of other modalities. That leaves BSGI as a potential alternative to ultrasound or MRI for breast evaluation after an indeterminate mammogram. “I don’t think MRI is the way to go with indeterminate patients,” Weigert says. On an MRI, many different things “light up,” Stern says. Another factor when considering modalities involves ease of use. 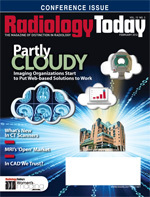 In general, physicians find that gamma imaging is less time consuming and more patient friendly compared with MRI and more in line with ultrasound costs. According to Teal, BSGI comes in at one-tenth the cost of MRI. Those involved agree that MRI should not be ruled out but that all viable options should be considered. From a patient-comfort perspective, Barnes says BSGI is most similar to undergoing a mammogram, just with a contrast injection, compared with ultrasound and MRI. Stern concurs with Barnes regarding what patients experience when undergoing BSGI. Women sit in a chair during the scan and can even watch TV. There is a contrast injection and, as with a standard mammogram, there is a plate that rests on the breast. However, there is no compression. The device takes four to six images, which are simple and easy to read, Stern says. Barnes’ most recent BSGI exam took place in March 2011. She will continue to undergo gamma imaging on an annual basis, along with annual mammograms scheduled for the six months between each BSGI. She is comfortable with this staggered screening schedule and feels confident that this will keep her breast cancer in check. “This test [BSGI] should be a part of a woman’s regular screening process if she has a history of breast cancer in her family or had breast cancer herself,” Barnes says. While BSGI is still a diagnostic tool, radiologists and surgeons both agree that this modality should have a place in the breast cancer screening process, helping with both the detection and the successful removal of cancerous lesions from high-risk women. As Barnes learned, its specificity can provide a clear picture of what the future holds.